"The Old West Revisited" is the 79th Mandrake Sunday story. The story was written by Lee Falk and drawn by Phil Davis. Mandrake and Lothar visit Willowbend, a western town taken over by the Cactus gang. Jim, member of the Cactus gang. Luke, member of the Cactus gang. Big Jim, chief of the Cactus gang. 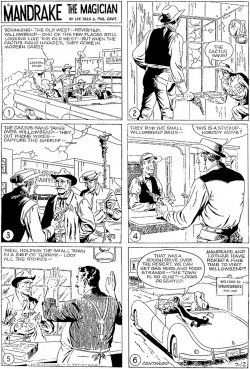 The story title is taken from the strip of July 5 and 12, 1959 (Next Week: "Old West -- Revisited" & Beginning: The Old West -- Revisited). This page was last edited on 4 November 2018, at 18:53.